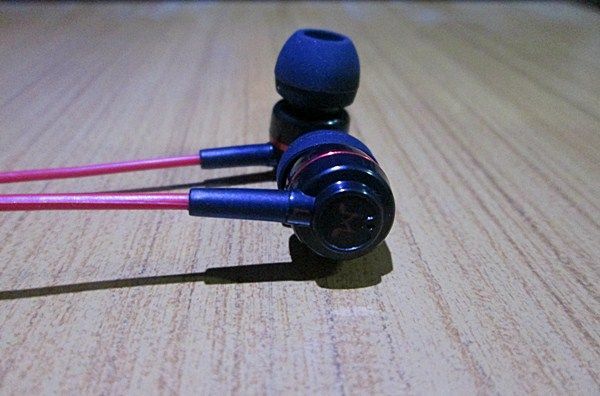 Soundmagic ES18 is an in-ear headphones manufactured by Chinese Pro Audio company Soundmagic. Soundmagic are known for their Pro audio devices which offers great quality but at rock bottom prices. There are high chances that you might haven’t heard about SoundMAGIC brand till now but its the one audio brand I advise you to remember. SoundMAGIC originates China from are primarily known for producing high-grade audio products lower price. Do not under-estimate them by hearing the name of the country from which it originates. Talking about the product SoundMAGIC ES18 is a low-cost noise isolating in-ear headphone. It sports a 3.5mm jack and sits in the low-cost budget segment. Read on to know if they’re worth the money you pay? Product Packaging and What’s Inside? The packaging of SoundMAGIC ES18 is reasonably OK for they price they come in and can’t complain much as it is sturdy; it can surely prevent the product from normal drops or improper handling. 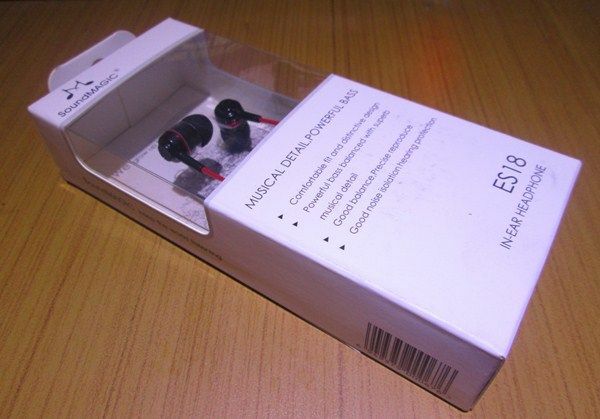 But you have to be careful while removing SoundMAGIC ES18 earphones from the package; it took me almost 5 minutes to get them completely out of the box. The package consists of SoundMAGIC ES18 earphones, two extra silicone tip (small and large), flexible storage pouch and some literature. Let me tell you no other brand is offering a flex storage pouch at this price. So more love to SoundMAGIC for providing extra accessory. SoundMAGIC ES18 is a 3.5mm noise isolating in-ear headphone. It offers excellent features at a price demanded by the manufacturer. A 10mm driver is enclosed within its cans, much better as Creative EP630 offers 9mm drivers at the same price. It offers frequency range between 15Hz – 22KHz, FYI an adult human ear is capable of hearing sounds ranging at a max frequency of 13-15KHz. The earphones have a perforation at its back so as to allow free movement of air. The cable is 1.25m and is relatively long to satisfy the average human height. The 3.5mm jack is L-shaped (more love there) and is gold-plated so as to reduce noise contamination. Talking about its build quality, SoundMAGIC ES18 are pretty lightweight but not sure if it could last long (like six months). The earphone cables are very slim and have a very small girth; with a little harsh pressure they could break off easily. However, they are sturdy enough to withstand normal day-to-day stress. The one which I’m reviewing is red in color, color on the cable is bright and doesn’t look cheap at all. The cables are rubber coated and prone to get slightly tangled if stored without proper folding. I know a lot of you people just like me have a habit of stuffing away your earphones in your pocket or bag. No matter how costly your earphones are or how great their build quality is, the copper wires inside them are pretty fragile. You should always follow a correct method to fold your headphone. 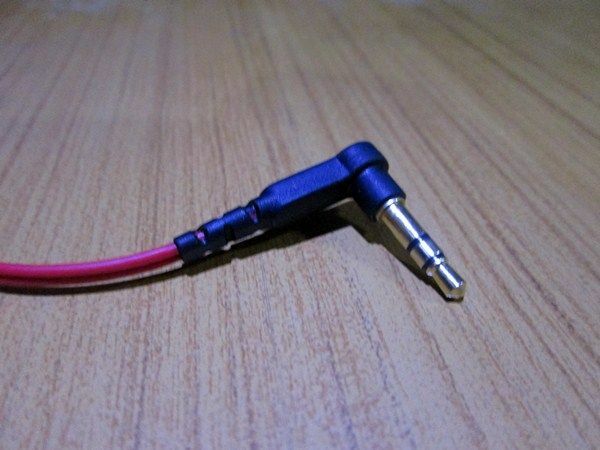 The best thing about these earphones is that they come with an L-shaped connector, this reduces the chances of internal wire break at the stem of earphones; which is a common problem. The mid-sized silicone ear tip ensures proper seal and reduces a lot of unwanted noise, so noise isolation works great here. When you move around with songs blaring through them, everything else seems quiet. Whereas, you can still hear sharp sounds like the car or train honks. Since these weigh only 11 grams, you won’t feel its weight. A little niggle that is prominent with SoundMAGIC ES18 is when you walk with these on, and you stop a song, you’ll hear the vibrations from the rubber-coated wires, but it disappears as soon as you start playing music. One major problem I have with these is that the left and right marking is tiny and is hard to see in normal light too and in the pitch dark only guessing works. As I said above, the mid-sized silicone tips offer great seal and cancel a lot of external noise. This helps you to enjoy only your favorite music and nothing else except sharp noises. SoundMAGIC ES18 offers excellent performance compared to its competitors, and that’s what the company motto claims. There are very few earphones that offer such quality in this sensitive price bracket. Mid-range sound is where ES18 can beat any other earphones priced more than Rs.1500, even the low-range sound is exceptional for the price, so expect a good bass response from these. The sound stage I felt is much better than Cowom EM1, so you could precisely hear and differentiate what kind of instrument is playing in your music. Never heard such great clarity in sound even from the ones which cost twice its price. These are made for sound precision, and it does offer it. Acoustic, jazz, soft rock and blues is where these in-ear headphones shine brightly. Even screencast videos with voice over are the pleasure to hear without hurting your ears. Listen to modern rock songs at full volume and the sounds crackles a little bit at high pitch frequency. You can only identify this only if you listen to it carefully. Adding a microfiber mesh seen in Cowon EM1 could have eliminated this. SoundMAGIC ES18 are compatible with every device sporting a 3.5mm jack. However, you might feel the sound difference on different devices. Most smartphones have low-powered cheap amplifiers, using it with a sound card or a headphone amplifier will do all the justice. To get great sound output, play with the equalizer settings of your smartphone or laptop until you get a perfect balance between vocals and music. IMPORTANT! Must Read: Use in-ear headphones properly, Prevent hearing damage. SoundMAGIC ES18 are however not bass heavy like Creative EP630; they have distinctive sound with warm signature and the one that audiophiles appreciate. I pretty much appreciate how SoundMAGIC ES18 offer best sound quality without spreading off too much. They’re like the silent warriors. I’d recommend these to anyone who has a tight budget and wants bang for every buck paid. I loved every bit of SoundMAGIC ES18, but there are tiny niggles that didn’t go down my throat very well. The build quality is pretty average; I believe SoundMAGIC recognized it and hence provided a carry pouch. Even the left, right markings can annoy you, as they aren’t quickly visible. SoundMAGIC ES18 has an overall excellent sound quality. Well if you want a thumping bass response then I’d suggest you go with Creative EP630 and if you want a better and ruggedly built in-ear headphones, then Cowon EM1 is your best choice. Hurry Up! SoundMagic ES18 is now available! Do not miss it! Rest is all up to you! Have a great day! This is a very quality integrated post, I am always amazed whenever I came although. I heard a lot about Soundmagic and know the features but still I am happy to see a complete review. Thanks mate and good day. Yeah Soundmagic ES18 really are better Vivek than compared to Sennheiser CX180 or any other budget or mid-range earphones from Skullcandy and Sennheiser. A lot of people avoid Soundmagic because its lesser known brand name and originates from China but people who have experience about VFM earphones swear by SoundMagic. Best mid range headphone. Recommend it to every one. Can you suggest me which one is best among soundmagic es-18, aoundmagic es-18s bs and creative ep-630 deep baas. But can you please make a CRISP DIFFERENCE SUMMARY between ES18 and EM1 ?? Also how is “Sony MDR XB30” different from these ? Please would be helpful. THANKS !! i’ve had my es18 for almost 1 1/2 year and all i can say is that it did not let me down whenever i plug it in to my phone and listen to music.it delivers a rich,clear sounds especially when it comes to vocals.its bass is just right to go along with all the frequencies to make the listening a pleasure to my ears.i accidentally pulled it off from my phone a couple of times and it didnt break or damage the wires.the build quality is quite good and may last long for about 2-3 years as per my usage.i plan on buying two more of this just in case my current one breaks.overall this iem is fantastic and theres nothing bad i can say about it.i would definitely recommend this to everyone. Well, I got sennheiser cx 180. Bought it from Flipkart and paid extra 140 for 1 day delivery. Haha!. So, did I made a wrong decision overall? I mean is this the time to switch upto your reviewed sound magic product? I have used them all, creative ep 630, soundmagic es 18, soundmagic pl11, phillips she range, senheiser cx180. All of them havegreat sound but average build quality, with creative being worst followed by soundmagic, senheiser compensates with unbelievable 2yrs on the spot replacement warranty, which i have used many times. Personally i thingk cx180 are too harsh, phillips she range sound the best, ep630 for bass lovers. Today i am ordering cowon em1 with mic, great reviews, flat wires plus i have a brand connect with them as i have used their pmp players and also cowon jet audio software. Prabhjit my friend, Cowon too are best. SoundMagic ES18 and Cowon EM1 are the only two major competitors in the budget range. As per my experience using both for good amount of time, Cowon EM1 are a little low on bass whereas ES18 has a balanced sound! Can you suggest me good earphones for Rock music? I was thinking to buy soundmagic and audio technica earbuds. I couldn’t decide which one i should buy. Im using soundmagic es18 from 7 8months. Its awesome earphones. Now im planing to buy Panasonic RP TCM 125. Can u please review this headphones? SM ES18 vs. Panasonic RP TCM 150?? I have iem of sennheiser cx 180 street 2, creative ep 630, soundmagic es 18, cowon em 1 and latest mi piston 3. I regularly use all of these and I love iem. Believe me soundmagic es 18 is just overhyped it doesn’t have bass at all and very low on volume so please don’t be misguided just stay away from it. Does this have a mic facility???? Too bad they are not available for the same price over amazon.com, I will have to ask my friends to pick it and deliver to me or I will try it out but its just double price in US. Thanks for sharing the amazing review Abhishek. soundmagic es18 are awesome for the price may be even better than the rest…!! already been one year and still going ? strong with a sturdy design. love them. This is really one of the best earphones reviews I have ever read on the internet. High-quality presentation! Keep up the good work bro!